Bedz King Twin Bed Mission Style with Twin Trundle in Cappuccino | Finish is child-safe | Solid Brazilian Pine – no particle board or mdf | No need for a bunkie board or a bunkie mattress as this bunk bed comes with a complete set of slats | Assembly required with included tools | SALE IS FOR BUNK BED and TRUNDLE ONLY EXCLUDES MATTRESSES | Total bed external dimensions are approx 38 high x 80 1/2 long x 43 inches deep. Space between floor and bottom rail is 11 inches. Headboard is 38 1/2 high x 43 wide, the Footboard is 19 high x 43 inches wide. 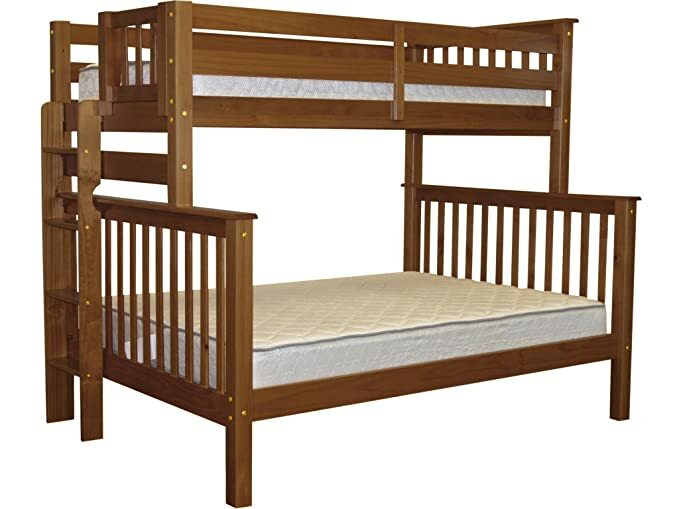 Bedz King End Ladder Bunk Beds Twin over Full in Expresso | Bunk Bed converts to 1 Twin Bed and 1 Full Bed | The Top Bunk Foot Board will have the gap that is the entryway for the Ladder | Finish is child-safe | Solid Brazilian Pine – no particle board or mdf | No need for a bunkie board or a bunkie mattress as this bunk bed comes with a complete set of slats | Assembly required with included tools | SALE IS FOR BUNK BED ONLY EXCLUDES MATTRESSES | Total bunk bed external dimensions are approx 69 high x 81 long x 58 1/2 inches deep. Bottom bunk is approx 10 1/2 inches off the floor – space between bottom bunk slats and top bunk slats (excluding the mattress) is approx 38 inches. 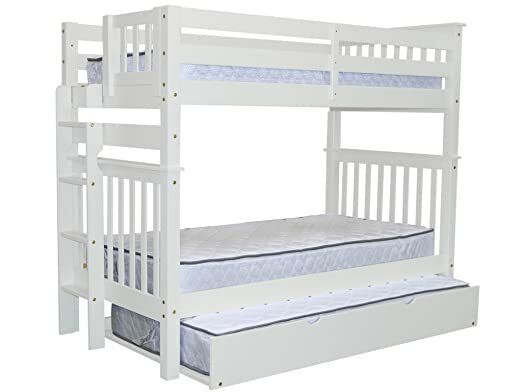 Bedz King End Ladder Bunk Beds Twin over Full in White | Bunk Bed converts to 1 Twin Bed and 1 Full Bed | The Top Bunk Foot Board will have the gap that is the entryway for the Ladder | Finish is child-safe | Solid Brazilian Pine – no particle board or mdf | No need for a bunkie board or a bunkie mattress as this bunk bed comes with a complete set of slats | Assembly required with included tools | SALE IS FOR BUNK BED ONLY EXCLUDES MATTRESSES | Total bunk bed external dimensions are approx 69 high x 81 long x 58 1/2 inches deep. Bottom bunk is approx 10 1/2 inches off the floor – space between bottom bunk slats and top bunk slats (excluding the mattress) is approx 38 inches. 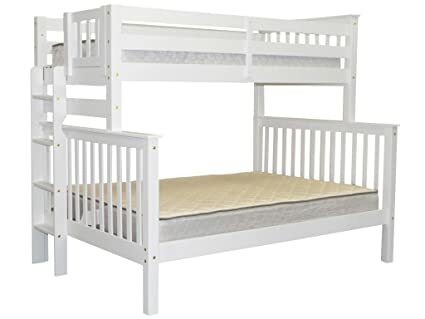 Bedz King Stairway Bunk Beds Twin over Full in Gray with 2 Under Bed Drawers | Bunk Bed converts to 1 Twin Bed and 1 Full Bed | The Top Bunk Foot Board will have the gap that is the entryway for the Stairway | Finish is child-safe | Solid Brazilian Pine – no particle board or mdf | No need for a bunkie board or a bunkie mattress as this bunk bed comes with a complete set of slats | Assembly required with included tools | SALE IS FOR BUNK BED and DRAWERS ONLY EXCLUDES MATTRESSES | Total bunk bed external dimensions are approx 69 high x 103 1/2 long x 58 1/2 inches deep. Bottom bunk is approx 10 1/2 inches off the floor – space between bottom bunk slats and top bunk slats (excluding the mattress) is approx 38 inches. 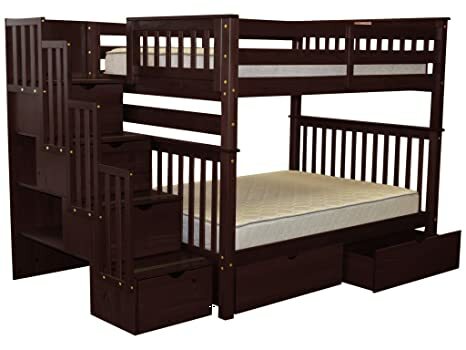 Bedz King Stairway Bunk Beds Full over Full in Cappuccino with 2 Under Bed Drawers | Bunk Bed converts to 2 Full Beds | The Top Bunk Foot Board will have the gap that is the entryway for the Stairway | Finish is child-safe | Solid Brazilian Pine – no particle board or mdf | No need for a bunkie board or a bunkie mattress as this bunk bed comes with a complete set of slats | Assembly required with included tools | SALE IS FOR BUNK BED and DRAWERS ONLY EXCLUDES MATTRESSES | Total bunk bed external dimensions are approx 69 high x 103 long x 58 1/2 inches deep. Bottom bunk is approx 10 1/2 inches off the floor – space between bottom bunk slats and top bunk slats (excluding the mattress) is approx 37 1/2 inches. 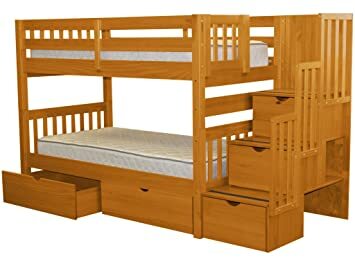 Bedz King Stairway Bunk Beds Twin over Twin in Honey with 2 Under Bed Drawers | 3 Drawers Built in to the Steps | Bunk Bed converts to 2 Single Beds | The Top Bunk Foot Board will have the gap that is the entryway for the Stairway | Finish is child-safe | Solid Brazilian Pine – no particle board or mdf | No need for a bunkie board or a bunkie mattress as this bunk bed comes with a complete set of slats | Assembly required with included tools | SALE IS FOR BUNK BED and DRAWERS ONLY EXCLUDES MATTRESSES | Total bunk bed external dimensions are approx 61 high x 102 long x 42 inches deep. Bottom bunk is approx 11 inches off the floor – space between bottom bunk slats and top bunk slats (excluding the mattress) is approx 31 1/2 inches. 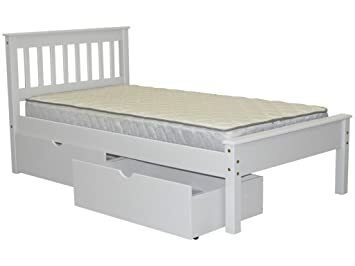 Bedz King Captains Twin Bed with Twin Trundle and 3 Drawers in White | Captains Bed with Roll Out Twin Trundle and 3 Drawers | Finish is child-safe | Solid Brazilian Pine – no particle board or mdf | Assembly required with included tools | SALE IS FOR CAPTAINS BED ONLY EXCLUDES MATTRESSES | Total bed external dimensions are approx 39 high x 76 1/2 long x 41 1/2 inches deep. Measurements of the Trundle are approx 74 long x 41 wide x 10 inches high. The trundle is 12 inches off the floor, the twin bed 23 inches off the floor high x 58 inches wide. 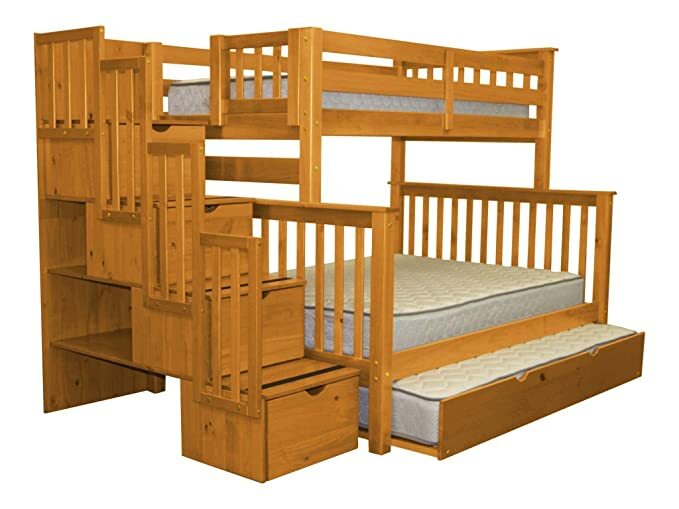 Bedz King Stairway Bunk Beds Twin over Full in Honey with Twin Trundle | Bunk Bed converts to 1 Twin Bed and 1 Full Bed | The Top Bunk Foot Board will have the gap that is the entryway for the Stairway | Finish is child-safe | Solid Brazilian Pine – no particle board or mdf | No need for a bunkie board or a bunkie mattress as this bunk bed comes with a complete set of slats | Assembly required with included tools | SALE IS FOR BUNK BED and TRUNDLE ONLY EXCLUDES MATTRESSES | Total bunk bed external dimensions are approx 69 high x 103 1/2 long x 58 1/2 inches deep. Bottom bunk is approx 10 1/2 inches off the floor – space between bottom bunk slats and top bunk slats (excluding the mattress) is approx 38 inches. 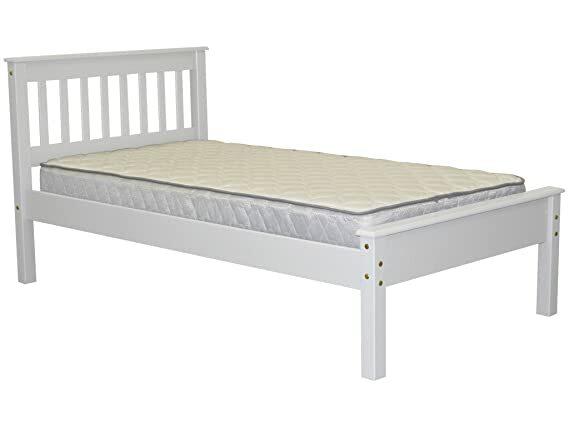 Bedz King Twin Bed Mission Style in White | Finish is child-safe | Solid Brazilian Pine – no particle board or mdf | No need for a bunkie board or a bunkie mattress as this bed comes with a complete set of slats | Assembly required with included tools | SALE IS FOR BED ONLY EXCLUDES MATTRESSES | Total bed external dimensions are approx 38 high x 80 1/2 long x 43 inches deep. Space between floor and bottom rail is 11 inches. Headboard is 38 1/2 high x 43 wide, the Footboard is 19 high x 43 inches wide. 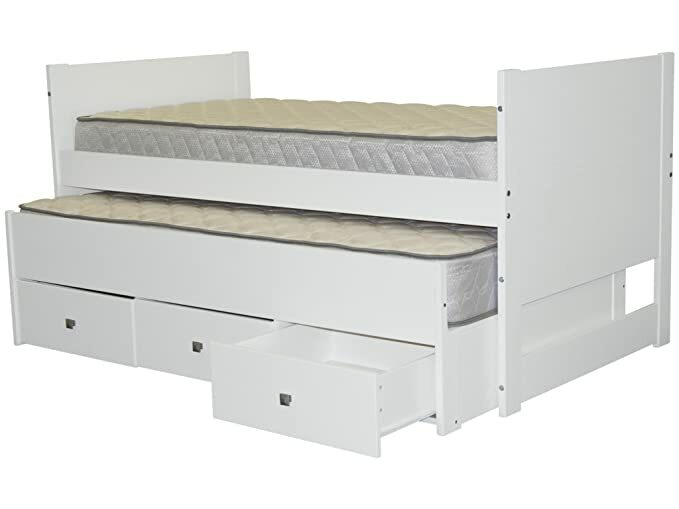 Bedz King Twin Bed Mission Style with 2 Under Bed Drawers in White | Finish is child-safe | Solid Brazilian Pine – no particle board or mdf | No need for a bunkie board or a bunkie mattress as this bunk bed comes with a complete set of slats | Assembly required with included tools | SALE IS FOR BED and DRAWERS ONLY EXCLUDES MATTRESSES | Total bed external dimensions are approx 38 high x 80 1/2 long x 43 inches deep. Space between floor and bottom rail is 11 inches. Headboard is 38 1/2 high x 43 wide, the Footboard is 19 high x 43 inches wide. 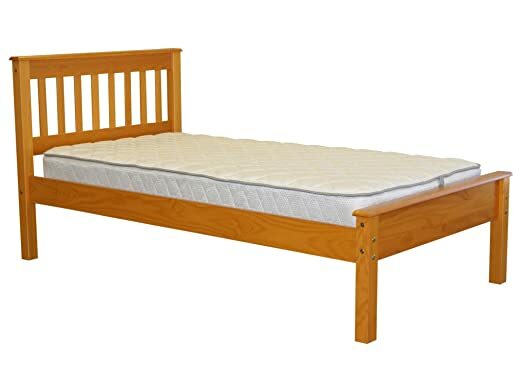 Bedz King Twin Bed Mission Style in Honey | Finish is child-safe | Solid Brazilian Pine – no particle board or mdf | No need for a bunkie board or a bunkie mattress as this bed comes with a complete set of slats | Assembly required with included tools | SALE IS FOR BED ONLY EXCLUDES MATTRESSES | Total bed external dimensions are approx 38 high x 80 1/2 long x 43 inches deep. Space between floor and bottom rail is 11 inches. Headboard is 38 1/2 high x 43 wide, the Footboard is 19 high x 43 inches wide. 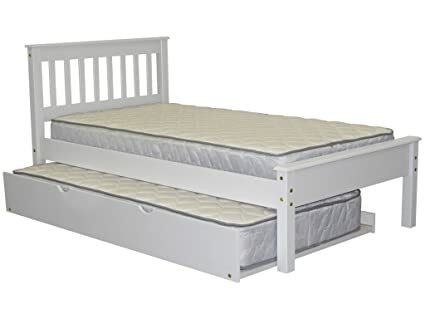 Bedz King Twin Bed Mission Style with Twin Trundle in White | Finish is child-safe | Solid Brazilian Pine – no particle board or mdf | No need for a bunkie board or a bunkie mattress as this bunk bed comes with a complete set of slats | Assembly required with included tools | SALE IS FOR BUNK BED and TRUNDLE ONLY EXCLUDES MATTRESSES | Total bed external dimensions are approx 38 high x 80 1/2 long x 43 inches deep. Space between floor and bottom rail is 11 inches. Headboard is 38 1/2 high x 43 wide, the Footboard is 19 high x 43 inches wide. 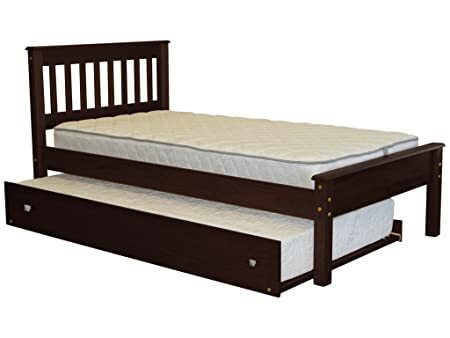 Bedz King Stairway Bunk Beds Twin over Full in Cappuccino with Twin Trundle | Bunk Bed converts to 1 Twin Bed and 1 Full Bed | The Top Bunk Foot Board will have the gap that is the entryway for the Stairway | Finish is child-safe | Solid Brazilian Pine – no particle board or mdf | No need for a bunkie board or a bunkie mattress as this bunk bed comes with a complete set of slats | Assembly required with included tools | SALE IS FOR BUNK BED and TRUNDLE ONLY EXCLUDES MATTRESSES | Total bunk bed external dimensions are approx 69 high x 103 1/2 long x 58 1/2 inches deep. Bottom bunk is approx 10 1/2 inches off the floor – space between bottom bunk slats and top bunk slats (excluding the mattress) is approx 38 inches. Bedz King Twin Bed Mission Style in Expresso | Finish is child-safe | Solid Brazilian Pine – no particle board or mdf | No need for a bunkie board or a bunkie mattress as this bed comes with a complete set of slats | Assembly required with included tools | SALE IS FOR BED ONLY EXCLUDES MATTRESSES | Total bed external dimensions are approx 38 high x 80 1/2 long x 43 inches deep. Space between floor and bottom rail is 11 inches. Headboard is 38 1/2 high x 43 wide, the Footboard is 19 high x 43 inches wide.